If you’re feeling stuck right now on the journey to change your drinking, it may be because you’re trapped in the wanting phase of the process. You want to stop waking up with a hangover, but when you’re in a situation that makes you feel anxious, or upset, or inferior, you break all the promises you made yourself. It’s too hard. I just need a drink. I was stuck in this wanting phase for over a decade. Wanting to change your desire is passive – and you have to take action to reach your goals, whether they relate to drinking or not. It may be hard to hear, but if you’re not getting where you want to go, it may be because you’re not truly committed to change. Listen in as I describe the crucial differences between wanting something to change and committing to making it change. Tons of my clients have been able to change not only their relationship with alcohol, but how they approach all of their goals and dreams. Committing to change may not feel easy in the short run, but it’s much easier (and rewarding) in the long run than it is to be trapped in the passive limbo of wanting change. How to change your drinking habit (or any other habit that’s not serving you) if you’re feeling stuck. The critical difference between wanting to change and committing to change. Why I was stuck for a decade just wanting to change my drinking, and why I only made real progress once I committed to change. How to find your breaking point and how to turn it into the place you can find freedom from your desire. The importance of learning how to manage your brain and how these skills can help you achieve anything you want in life. 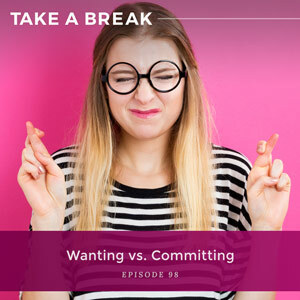 You are listening to the Take A Break podcast with Rachel Hart, episode 98. Well hello, everybody. I have to tell you, I have been on a real high today. I have been feeling really, really good because I have been talking with a couple of my former clients. And it has been amazing. So, for those of you who don’t know, I had a baby this past summer, so I had a little maternity leave. And now I’m back and I’m reconnecting with some of my former clients. And I have been hearing all about these amazing changes that they have made, and not just around the habit of drinking. Not just no longer having it as part of their nightly routine or cutting how much they drink in half, or, for some of them, deciding that actually they don’t want to drink at all. It’s not serving them and they’re recognizing that they don’t truly desire it. 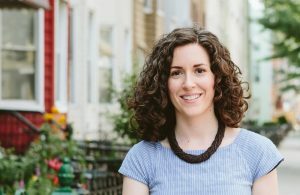 I mean, that alone, those kinds of changes alone are amazing, but what I really love hearing about is how they have used this work, used the think-feel-act cycle, not just to change their drinking, but to create huge results in their life; asking for and getting a promotion, quitting a job that they had been stuck in for so long because they were afraid to leave, starting a business, buying a house, finding a partner, healing relationships, starting writing and painting and running again. I love hearing about this because the think-feel-act cycle, really learning it, mastering it, is a meta-skill. So it is something that you can apply not only to fix what isn’t working in your life, not only to change your drinking when the habit is no longer serving you, but also to create what you want. The cycle shows you not just why you’re overdrinking, not just why you’re overeating or overspending or procrastinating or staying stuck or repeating the same patterns over and over again in life, it shows you how to create what you want. It shows you how to create new results; things that you want to go after, your dreams, your hopes, things that you have told yourself for so long, I really want to do this. I really want to create this or become this, and haven’t done it. That’s why this work is so incredibly powerful. So I’ve been feeling great today. I love catching up with these people. I love hearing where my clients have been, what they have been doing, what they are creating. But I want to talk to you today about if you are feeling stuck right now, how to change the habit of drinking. And the answer is actually incredibly simple. It’s so simple, but it evaded me for years. I just could not understand why I couldn’t figure it out. And the reason was this; if you want to change the habit of drinking, or any habit in your life that is not serving you, you must go from wanting to change to committing to change. That’s it. That’s the answer. It’s so simple, but it is such a profound mental shift and it is why I was stuck for years. It is why I see so many people who are stuck as well. And it is something that, once you start to understand the difference between wanting and committing, can change everything for you. Because I was stuck in wanting, probably from the age of 22 until my early 30s, so over a decade, I was stuck in wanting. I wanted alcohol not to be an issue for me. I wanted to drink like everyone else. I wanted not to need a drink, not to need a buzz, to feel funny and confident and outgoing. And most of all, I just wanted not to desire alcohol so much. That was such a problem for me; feeling like I had all this desire that other people didn’t seem to have. Why was I cursed with all this desire for alcohol? I wanted not to want it because as long as I wanted it, as long as I had all this desire, I was always in this state of wanting more, wanting another drink, wanting another round. Or, if I wasn’t drinking, if I was telling myself no and using willpower, I was in this state of feeling deprived all the time. And so the idea of just not wanting it was something that I sought after. But here’s the thing; despite all of this wanting, wanting things to change for over a decade, I wasn’t actually committed. Now, I told myself that I was. I told myself, “Listen, I would do anything to change my drinking. I want this more than anything in the world. I am so sick of it. It’s causing all these problems. I hate feeling different. I hate feeling like I’m the one who’s the odd man out.” But you know what – despite what I was telling myself – it simply wasn’t the truth. It wasn’t the truth that I would do anything to change it, because, you know what – I wasn’t. And here’s how to know if you are in the same boat when it comes to changing your drinking, when you think about this habit, when you think about everything you have done in an attempt to change it or to fix it. Ask yourself, have you or are you willing to keep taking action no matter what? Because when I really was honest with myself, the truth was this; I wanted things to be different but I also didn’t want to be uncomfortable. I was not willing to be uncomfortable. I wanted change, but I also wanted change to come with comfort. And even when I was willing to be a little bit uncomfortable, it was only up until a point. And that is why I flip-flopped with my drinking all throughout my 20s. So I would start and I would stop and I would do this over and over again. I would wake up one day after a night of drinking and I would feel hung over and I would swear up and down I would never do this again. I never wanted to feel this way. I never wanted to piece together my night. I never wanted to regret what I said or I did. I never wanted to be, yet again, that girl who had one too many to drink. And so I would stop drinking for a day or a week or two weeks or a month. All that time, I was using willpower. All that time, I was just resisting my desire, or I was hiding out. I was isolating. So I was just turning down invites. I was sequestering myself in my apartment thinking that that was the only way to be able to be successful. And what would happen? Well, I would reach my breaking point. Things would get too uncomfortable. Somebody’s wedding would be coming up and I would say, “Well how can I not drink at a wedding?” or a friend was visiting New York and I didn’t want her to know that I wasn’t drinking, so I would just make an exception. Or there was a party that I wanted to go to and I couldn’t imagine being sober at it. Or I had a bad breakup or a bad day at work, or I was in a fight with someone, or I was just feeling kind of down or anxious or insecure. Whatever it was, I got to a breaking point. And what would happen is that my emotional discomfort would grow and grow and grow and I would just end up saying, “Screw it, who cares? It’s too hard. I can’t do this.” And I would decide to drink again after swearing that I wouldn’t do it. And I did this over and over again because the truth was I wasn’t really committed. I wasn’t willing to keep taking action, no matter what. I wanted things to be different, but only if I could also be comfortable at the same time. And, of course, those two things are at odds. Change requires discomfort. It requires you to grow and to evolve and to become something different than what you are right now. That requires stepping out of your comfort zone, but I didn’t want that. I wanted things to be different, but I also wanted things to be easy. And I’ll tell you, a lot of you listening are in the same place. You are telling yourself that you are desperate to change your drinking but you’re also not really committing. And if it’s not overdrinking, maybe it’s overeating, maybe it’s overspending, maybe it’s procrastinating. Whatever it is, whatever you are telling yourself you want but then aren’t taking action to actually make a reality, then you are not committed because the difference between committing and wanting is really simple. Commitment requires action, even when it isn’t easy. Wanting is the opposite. Wanting is passive. It does not require anything at all beyond just sitting there and thinking about how you wish things were different. It is totally safe because it is passive. You can want in the comfort of your own home, all by yourself, curled up in your coach. You just want in your mind, you’re not doing anything. And what finally changed for me was this; I didn’t say, “I’m never going to drink again…” because I had done that too many times before. And you know what – it hadn’t worked. And when you do something over and over again and you realize it’s not working, well maybe it’s time to try something new. That is what I committed to. I committed to taking action until I figured out how can I feel good on my own. And you know what that meant; committing to being uncomfortable, no matter what. Because wanting had required nothing of me – committing meant that I had to learn other ways to cope with feeling anxious and stressed and awkward and insecure and uptight, rather than reaching for a drink. So I want you to know this – and it may be a little harsh to hear – but if you are frustrated with your drinking, if you are frustrated with the habit, if you are frustrated with the results that you keep getting from alcohol, your problem is really simple; you are not yet committed to change. It’s a little harsh to hear, but I promise, it’s actually good news because when you realize this, when you realize there is a breaking point for you, there’s a point where you just say, this is too hard, I’m too uncomfortable, that is where you get freedom. Because once you understand the difference between wanting and committing, you will also understand why you are not yet successful because wanting to change, which is passive, it does not require action, it only ever creates more wanting. So you think about change and you think about how you want things to be different and you think about how your life would be better, but meanwhile, you’re not taking action; you’re just thinking. The habit is still rolling. It’s still growing. It’s becoming more and more entrenched every time you repeat it. And the more entrenched it becomes, the more negative consequences you are creating for yourself; the less able you are to cope with whatever you are feeling unless you have a drink in your hand, the less able you are to manage your desire without saying yes. And what happens? As those negative consequences grow, guess what – you want change even more. But you’re still just wanting. Wanting creates more wanting. Committing, on the other hand, creates results because when you commit, you decide what you want and you start taking action until you get the result that you want. Or maybe, you take an action and it doesn’t really work the way you wanted it to, so you head to a party feeling a little awkward and a little insecure and you don’t go to the bar, you don’t immediately grab a drink, but then you’re still feeling a little awkward and a little insecure, and so you end up leaving early. You tell yourself, like, I just can’t do it. I can’t enjoy myself. You take what doesn’t work, you learn from it, and then you keep taking action until you get the result that you want. Wanting creates more wanting. Committing, telling yourself that you will continue to take action no matter what until you get the change that you want, that is what creates results. Now, the way to do this is actually pretty simple. You start by asking yourself, where do you want to be at the end of next year? Do you want to be thinking about your drinking? Do you want to be worrying about this habit? Do you want to be caught up in how it’s not serving you? Do you want to be waking up hung over and feeling foggy and regretting the night before? Do you want to be stressing about whether or not you’re ever going to figure this out? And frankly, do you want to be devoting so much of your mental energy to thinking about drinking? Where do you want to be 365 days from now? Because once you know where you want to be, you then need to get really honest with yourself about whether or not you are willing to commit to change; whether or not you are willing to commit to keep taking action, no matter what. And so here are some questions that can help you decide whether or not you’re really ready to commit. Are you committed to the result that you want and taking action, no matter how long it takes? So are you willing to commit to taking action no matter how long it takes? Are you committing to taking action, even if it gets difficult? And it will get difficult because you’re learning something new, and we cannot teach ourselves new skills, new ways of coping with how we feel, unless we step outside of our comfort zone, because right now, our comfort zone is pour a drink so I don’t have to feel the way I feel. Are you willing to keep taking action in the face of those feelings? Are you willing to be committed even when you don’t feel like it? Even when your brain wants you to believe that you’re too tired, you had too long of a day, there’s too much going on, or when your brain is telling you that you’re too busy and you don’t have time, are you willing to take action in these moments? Are you committed to trying as many strategies and approaches as you need until you figure out something that works for you? This was really a big one for me. It was really important for me to understand that I had to keep trying new things. I had to keep putting myself out there. I had to keep showing up, and if the way I was showing up wasn’t working, then I had to show up differently. And finally, are you committed to finding a solution to any of the obstacles that come up? I did a whole episode all about obstacles, but what happens for so many of us is we run into an obstacle and then that’s that. Are you willing to keep taking action, no matter the obstacle that you encounter? Because here’s the thing – unless you answer yes for all of these questions, you are stuck in wanting, wanting change but not actually being willing to create change. Once you commit, once you decide that you are all in, no matter what, I’m going to tell you what will happen, because it happened to me and I watch it happen to my clients over and over again. Your brain’s going to freak out. There will be conflict between your lower primitive brain and your higher human brain, your prefrontal cortex. And guess what – that is okay. That conflict is not a problem. There is supposed to be conflict because your lower brain and your higher brain have very different goals. Your lower brain, where that habit resides, wants things to be unconscious. It wants you to just go after a reward, no matter what. It wants immediate gratification. It wants pleasure at the expense of everything else. It thinks that’s what matters most in the world. Now, your prefrontal cortex, that higher brain, that human brain, can manage your lower brain. It can manage your desire. It actually evolved to overcome that more primitive part of your brain. Having a prefrontal cortex, which by the way, all of you have, is what makes you uniquely equipped to override the desires of your lower brain. It’s what makes you uniquely equipped to be able to bring consciousness and awareness to something that right now is kind of unconscious and just feels really automatic. The very fact that you want alcohol, that you’re desiring it, is only because you conditioned yourself to want it. That’s what your higher brain can do. So when you commit, when you go all in, when you are willing to take action no matter what, your brain’s going to freak out, but that’s okay. And what I want you to know is this; that practicing these skills – learning how to manage your mind, how to use your higher brain, your prefrontal cortex to manage that lower more primitive part of your brain where the habit resides, learning how to manage your desire, learning how to use the think-feel-act cycle so that you’re not just at the mercy of your habits, you can actually understand why they unfold the way they do – this really is a meta-skill. Letting that lower brain have a fit, be a toddler, freak out and not listen to it and say, “It’s okay, you can freak out, I hear you. Just because you’re freaking out, doesn’t mean I’m going to act on this desire.” That is a skill that not only will help you change your drinking, but it will allow you to go after whatever you want in life. And that is why, when I talk to my clients, they tell me about so much more that they are doing and accomplishing, other than just changing their drinking. And that’s why I always say that changing your drinking, changing this habit, really is the first step to getting a life that you want, because here’s what I believe; when you condition your brain to desire alcohol – and you did condition it. You did not come out of the womb desiring alcohol – when you condition your brain to want a drink, to want this highly concentrated reward, you create, unknowingly, all this over-desire. But when you learn how to overcome this desire, how to overcome your habitual unconscious primitive brain, when you learn how to actually use the think-feel-act cycle to de-condition yourself of this desire and change the habit, when you learn how to let your brain have a fit, be a toddler, throw a tantrum and you teach it that, “That’s okay, but I’m not going to react to it. I’m not going to act on this tantrum to have a drink, for this immediate gratification…” what happens is this; you become more evolved than if you never had to manage this over-desire in the first place. I want you to take that in because when I realized this, it really did kind of blow my mind. You become more evolved. Your brain is more evolved than if you never had to manage or change this habit because, what has happened, is that your brain evolved and becomes more advanced because you have to teach it on purpose how not to desire something. You have to teach it on purpose how to manage itself, how to manage the think-feel-act cycle. So when you learn how to master these skills, how to manage your brain in the face of your lower brain screaming out for a drink, in the face of your brain telling you, “You’re out of control, or I have no idea why I had that drink. It’s totally unconscious…” that’s what your brain wants you to believe, that you can’t bring awareness to it, when, of course, you can. When you do this, when you learn that your brain is going to make every excuse under the sun to try to convince you to deviate from your commitment, “Who cares? It’s a party? It’s the holidays. Just one, everybody else is. It’s not a big deal…” when you learn how to manage all of this, you will set the stage so that you can conquer anything, because you had to learn how to manage your own over-desire of alcohol. So when you have the skill, all of a sudden, you can start to apply it to anything you want to create. You can write a book. You can start a business. You can get in amazing physical shape. You can run a marathon. You can change careers. You can become financially independent. You can become your own biggest cheerleader, even after decades of beating yourself up. Whatever it is that you want in life, when you shift from wanting to committing, when you shift from knowing to doing, which, of course, requires action, when you take action over and over again and you purposely teach your brain something new in the face of wanting a concentrated reward like alcohol, you will have evolved your brain way more than someone who never had to deal with this. And I will tell you, I love this idea. I love, love, love thinking about the fact that this thing, this habit, my drinking, which for the longest time I thought was the worst part about me – how much I desired alcohol, how little control I felt, I thought it was the worst part about me. It turned out to be the thing that honestly was the best part about me. It turned out to be the thing that I was able to use a springboard to master my mind, as a springboard to create everything I wanted in life, for all my successes, all my achievements. That is what I think is so powerful about this work and is why I love it so much. So ask yourself, are you stuck in wanting or are you actually ready to commit, to take action, no matter what? No matter how long it takes, no matter what obstacles are in your way, no matter how uncomfortable you feel, because when you make that shift, that is when change is possible. Alright, everybody, I will see you next week.